Should I Tell my Neighbors That I am Planning to Have a Fence Installed? You are here: Home / Fence School / Should I Tell my Neighbors That I am Planning to Have a Fence Installed? Yes! It is always a good idea to inform your neighbors that you are thinking about building a fence. Most of the time they won’t oppose the idea, and may even show some appreciation for your home improvements! Some neighbors, however, can get pretty worked up on the subject of fences. Best to get these issues sorted out before we arrive on the scene. They might dispute the fence layout and/or your adjoining property line. Moving or removing a fence is disheartening for everyone involved. Or maybe they won’t let us walk on their property to install the fence. That takes all of the fun out of a job. 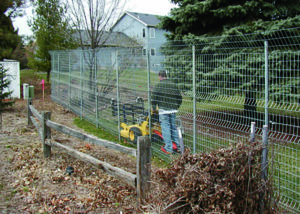 Chainlink fences sometimes are built to use a neighbor’s end or corner post. Connecting makes sense, but can result in a future situation where they (or new owners) want to remove their own chainlink fence. They you might need to call us back to install a new post for you. No matter what the situation is, communication is the best prevention!